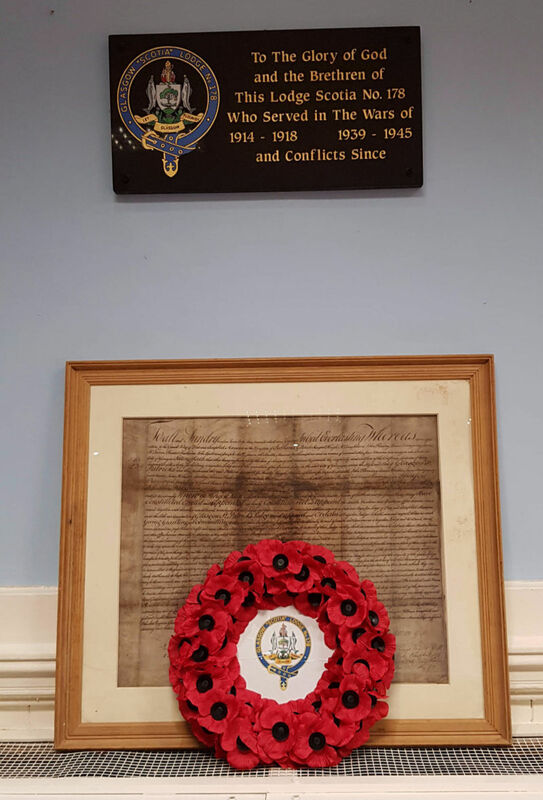 Tuesday 13 November, 2018 (almost 100 year to the day since the end of WW1) saw the dedication of a new War Memorial within the hall. 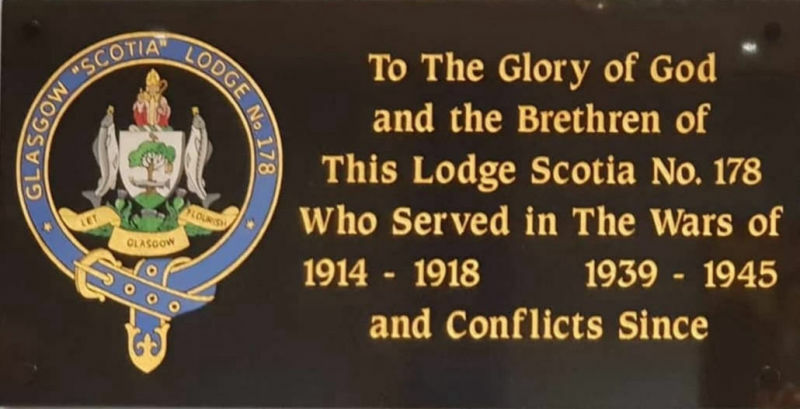 This is dedicated the Brethren of Lodge Scotia who served in both World Wars and Conflicts since. Provincial Grand Master, Brother James C. Peddie accompanied by the Immediate Past Provincial Grand Master, Brother Alistair Henderson, Past Provincial Grand Master Brother William C. Shepherdson, Depute Provincial Grand Master Brother Andrew Mushet and other PGL Office Bearers and Stewards were in attendance. 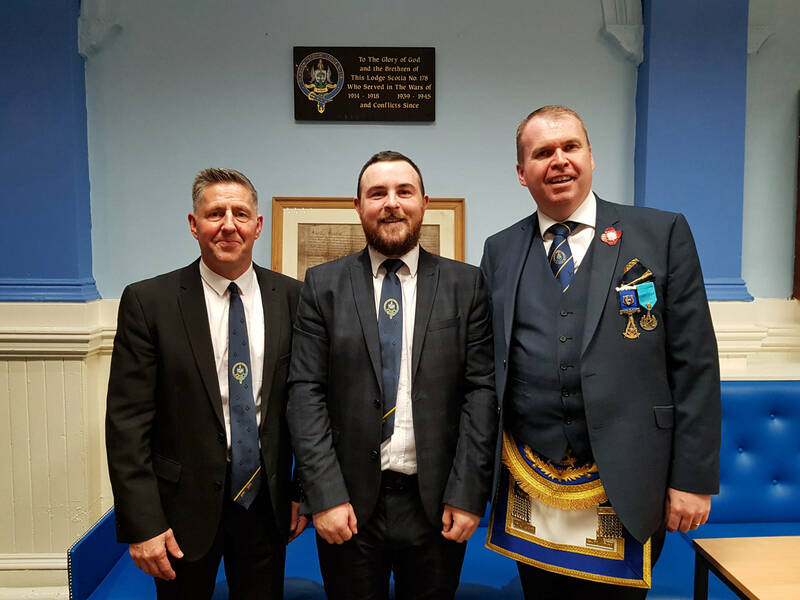 They were welcomed into the Lodge by the RWM Bro. Christopher Henderson. 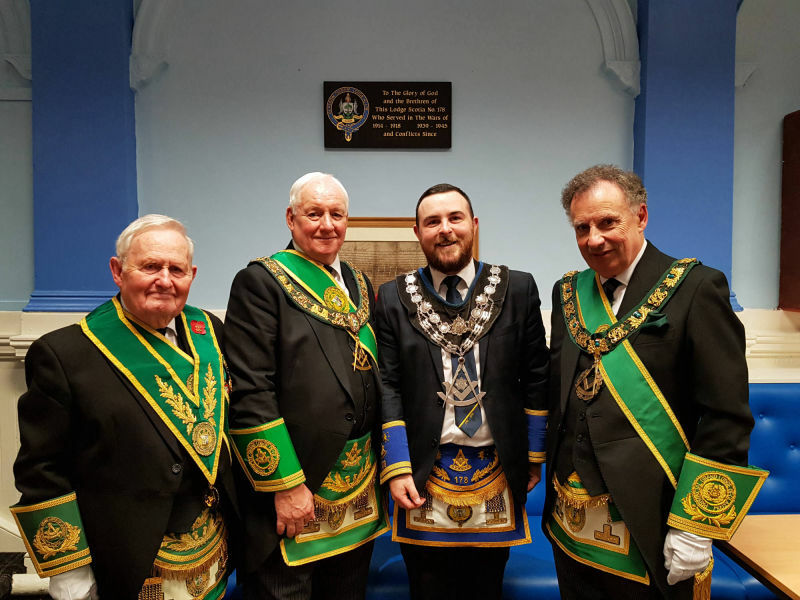 The Provincial Grand Master, Brother James C. Peddie, then unveiled the plaque and Brother Shepherdson then led a very sombre and poignant dedication ceremony. The idea, planning and execution of this memorial is all down to Bro. Mark Brown PM. Once he came up with the idea and having discussed it with the RWM, Mark then set about designing new lapel pins, incorporatong the Lodge Scotia logo with the Remembrance Poppy. One hundred and seventy eight of these were struck and Mark sold everyone himself in order to raise the funds to produce the plaque. Once the funds were raised Mark then designed the layout and inscription of the plaque. From here he sought the help of Bro. Graham Young WSW who took over the production duties. 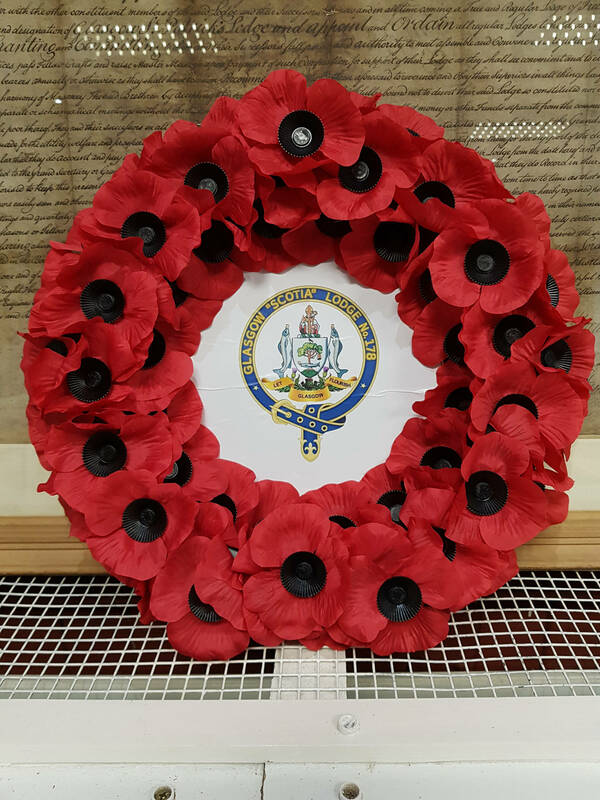 We can all agree that the finished product is a fitting tribute to those members of our Lodge who not only gave the ultimate sacrifice on behalf of their country but also to all those Brethren who have put others before themselves while serving in the armed forces during the many conflicts across the globe. The Lodge thanks Bro. Mark Brown PM and Bro. Graham Young for giving us something that will adorn our hall for as long as our Lodge continues and allow us to afford our heroes the respect and honour they deserve. 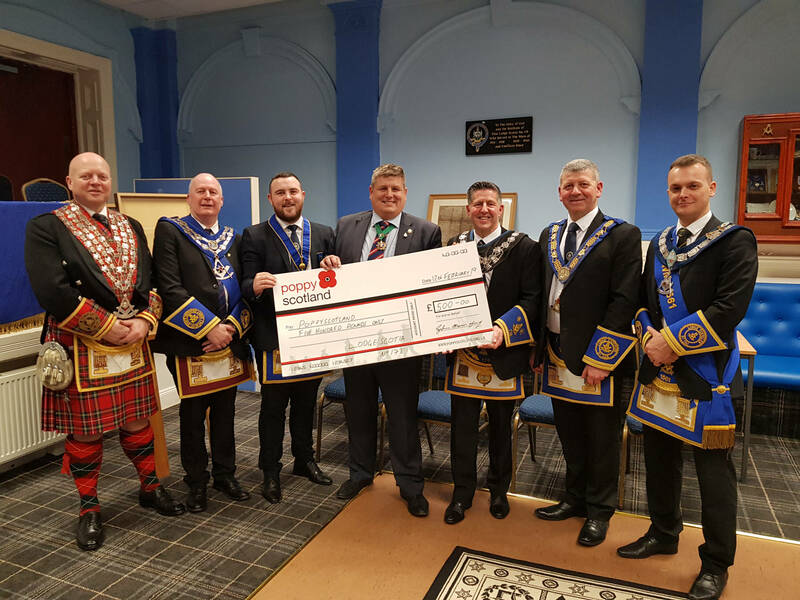 12th February, 2019 the Lodge had the greatest pleasure of donating a cheque to Poppy Scotland for £500. This sum was raised during the fundraising for and dedication of our War Memorial. 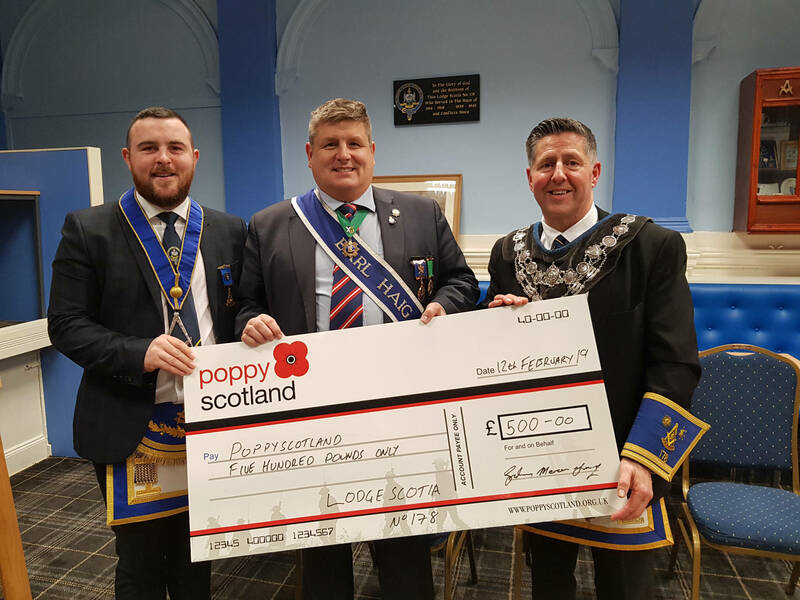 Collecting the cheque on the evening on behalf of Poppy Scotland was fellow Freemason, Bro. Gordon Ritchie of Lodge Earl Haig No. 1260. Once again the Lodge thanks Bro. Mark Brown PM for all his efforts in making this possible. .